The Jefferson Democrats are not the same team that won the state title a year ago. They're not even the same team that went unbeaten in the Portland Interscholastic League this season. 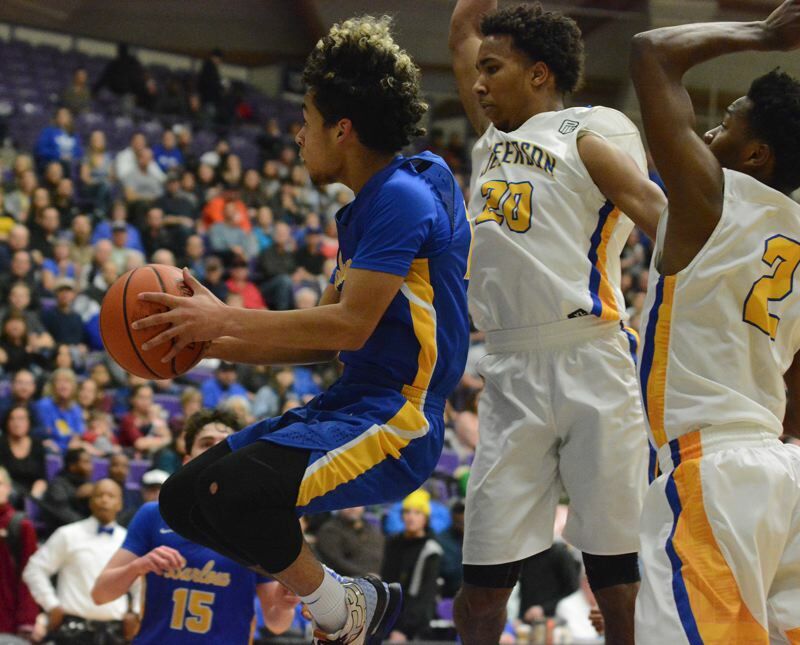 But on Friday, for the second time in as many state tournament games, the Democrats responded to a challenge and pulled away for a 80-60 win over Barlow in the semifinal round of the Oregon School Activities Association Class 6A boys basketball tournament. Next comes their fourth meeting with Grant this season. 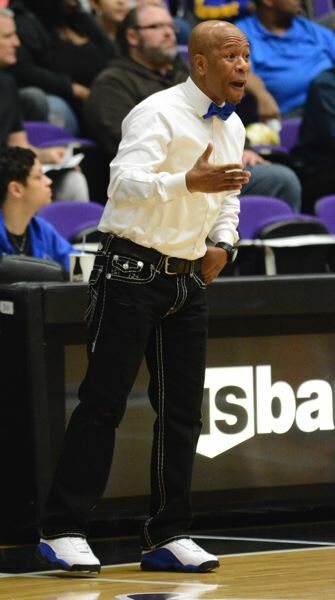 The PIL rivals will collide at 8:30 p.m. Saturday at Chiles Center for the state championship. "It's going to be fun," said Robert Ford, one of two Jefferson players who had significant roles in last season's title run. On a team known for its highlight-friendly style, Ford supplies plenty of grit. On Friday, that showed up statistically in his seven assists, six rebounds and three steals. His hustle play helped the Democrats (26-3) maintain a lead even while the Bruins' zone defense was presenting challenges. With top scorer Marcus Tsohonis out because of a broken finger, Ford has taken on more of the point guard role. He also is a key communicator on defense. On offense, Jalen Brown early and Keylin Vance in the second half helped make up for the loss of the 20-plus points that Tsohonis often produces. Brown made four 3-pointers in the first half to lead the Democrats with 16 points at halftime. Vance scored 13 of his 17 points in the second half to help Jeff pull away. And Kamaka Hepa played his second strong game in the tournament. The 6-10 senior finished with a game-high 23 points and 15 rebounds. Eight of his boards came on offense. "That was really big for us, being active on the offensive boards so we can get second-chance points," Hepa said. Jefferson's 19 second-chance points were one more than Barlow generated with its aggressive offensive rebounding. The Democrats separated themselves by scoring 15 points off of Barlow's 11 turnovers. 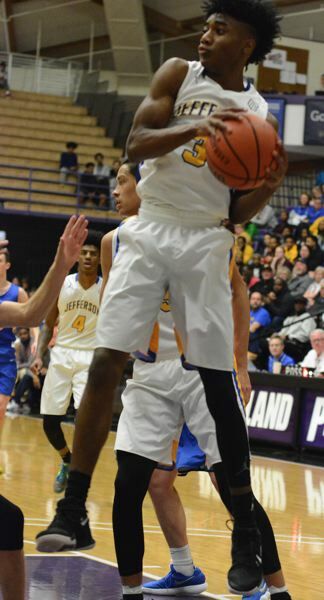 Khalil Chatman scored nine of his 13 points in the second half and finished with 10 rebounds to help the Democrats to a 45-36 advantage. Barlow's Jesse White scored seven of his team-high 15 points in the fourth quarter, but the Bruins couldn't keep pace down the stretch. Consecutive Hepa layups and a transition basket for Romeo Akil pushed the Jefferson lead to 16 early in the fourth quarter, and Barlow (19-9) was not closer than 14 the rest of the way. Jefferson led 40-33 at halftime, primarily by generating 14 points off turnovers. Hepa had 14 points and 10 rebounds, six on offense, in the first half. Now comes a shot at a second consecutive title. "We really want this one," Hepa said. "There's been a little bit of pressure, not from our coaches but from outside influences and whatnot. But I feel like with the work we've put in and how close we are as a team it's looking good for us." 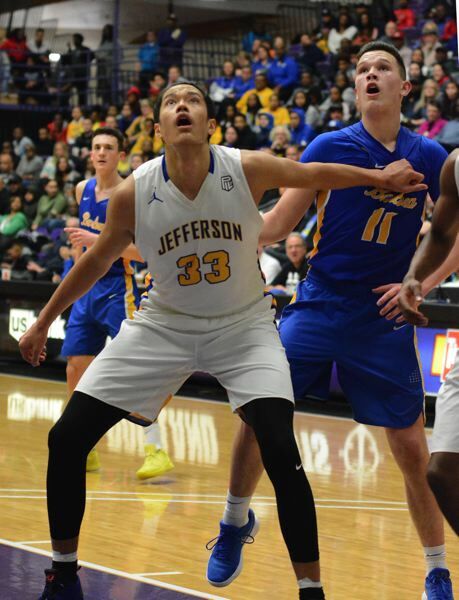 Tsohonis, who suffered a spiral fracture to the middle finger of his left hand in Jefferson's round-of-16 win, had surgery on Friday to place pins in the injured finger. He said it is expected to heal in two to three weeks. The highly-touted junior, who helped Jeff to the title last season, said watching from the bench is difficult. "I hate watching games I can't play," he said. But he likes what he has seen his teammates do in their quarterfinal and semifinal wins. "I'm not surprised," Tsohonis said. "They're playing harder. That's what I like to see."